Galaxy S7 and Galaxy S7 Edge were officially launched at MWC 2016. The SM-G920W8 is the Samsung Galaxy S6 Canadian variant. 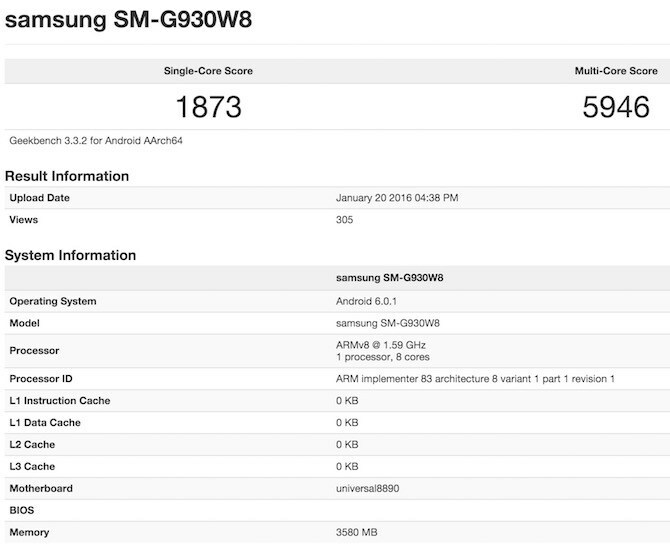 After that smartphone launch we have the reports that the Samsung Galaxy S7 with model number SM-G930W8 has passed through the GeekBench 3 benchmark. Definitely its the successor to Galaxy S6 smartphone, atleast successor as the Canadian variant of the device. Internally the Galaxy S7 is powered with Exynos 8890 CPU and the device scored 1873 in single core performance and in the multi-core it achieved 5946. Regarding the Samsung Galaxy S7, we have SM-G935A passing through the AnTuTu Benchmark and it revealed that the device is sports 5.1 inch Quad HD Display with 64 Gigs of internal storage, 12 mega pixel BRITCELL camera, 4 Gigs of RAM and it will be available in various variants which includes Galaxy S7 Edge, Galaxy S7 Plus and Samsung Galaxy S7 Edge+.